"Why do I want to kill God? Reason Two: If God was dead, the shops could stay open later on Sundays." Dawn Bundy is fifteen. She doesn't fit in and she couldn't care less. Dawn has other things on her mind. Her dad disappeared two years ago and it's all God's fault. When Dawn's dad found God, it was the worst time ever. He thought he'd found the answer to everything. 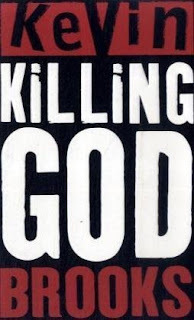 Kevin Brooks - Killing God wasn't exactly high on my 'to-read' list. Actually it was situated around the 150 mark. And then I was planning to attend an event with Cassandra Clare, Eoin Colfer and Kevin Brooks. Having read all books written by the former two authors - Mr Brooks suddenly shot up to the number one position. From the very beginning Dawn is very frank about herself, her alcoholic mother and her father - who's sudden departure two years previous leaves Dawn feeling resentful - not to him - but to God. And so in a desperate attempt to make sense of her messed-up life, she undertakes a campaign to kill God. But how do you kill someone that doesn't physically exist? Accompanied by her dogs, Jesus and Mary, Dawn sets her sights high as she struggles to deal with her real-life issues. With a raw, honest voice that is both ironic and humorous, she begins to unlock the secrets of her family's past. Killing God was a relatively quick read for me and I found myself laughing out loud quite a bit - but don't expect a happy ending. Published by Penguin - June 2009. I really do like the concept of this novel! I might have to check it out at some stage.